The City of Seaside Visitors Bureau invites tourism-project funding requests from businesses and organizations that produce programs or events designed to increase overnight visits to the area, promote tourist attractions in the region or develop programs targeted to visitors especially in the shoulder and winter months. 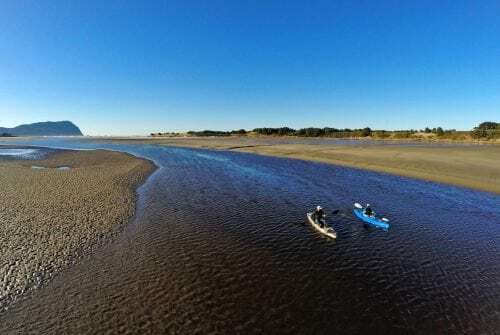 For the 2019-2020 fiscal year, it is expected that a total of $50,000 will be awarded for tourism development in Seaside. These funds are generated from transient room taxes (TRT) collected from overnight lodging facilities in Seaside. The Visitors Bureau is the fiscal administrator of these funds on behalf of the city with the assistance of the Tourism Advisory Committee. The funding cycle and application process has now opened for the 2019-2020 fiscal year. You can learn more by clicking the link below. After unveiling a new look for the Seaside Visitors Bureau in early 2016, we went to work to create a merchandise guide for local partners and stakeholders interested in selling shirts, stickers, bags, etc. with the new Seaside logo and iconography. Since then, we've also created a Brand Amplification Toolkit, fresh with ideas for name badges, pins (like the ones pictured) or just simple signatures within your email signature. We also created a banner you can place on your website to indicate your association with the Seaside Visitors Bureau. If you are interested in creating name tags that utilize our logo - and yours, along with pins to tell customers about your Seaside passion, please let us know. 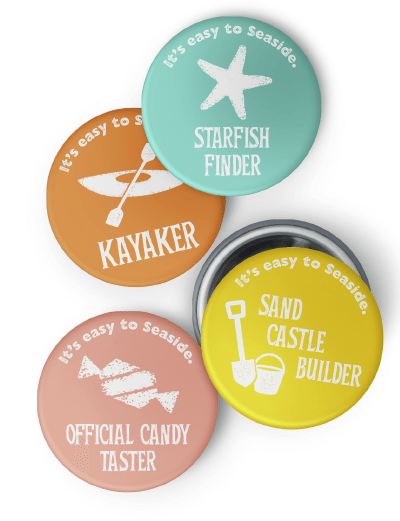 We can help you create the necessary tools to remind our visitors just how easy it is to Seaside! Please direct any questions you may have about the program to info@seasideor.com. The City of Seaside Visitors Bureau underwent an extensive rebranding project in the fall of 2015. After unveiling this new look in early 2016, we went to work to create a merchandise guide for local partners and stakeholders interested in selling shirts, stickers, bags, etc. with the new Seaside logo and iconography. If you are interested in creating your own merchandise with these logos and icons, please send an email to info@seasideor.com and provide a short description about your organization/business, the requested use (e.g. website, brochure, merchandise, etc.) and contact information so that we can reach back out to you about potential usage.